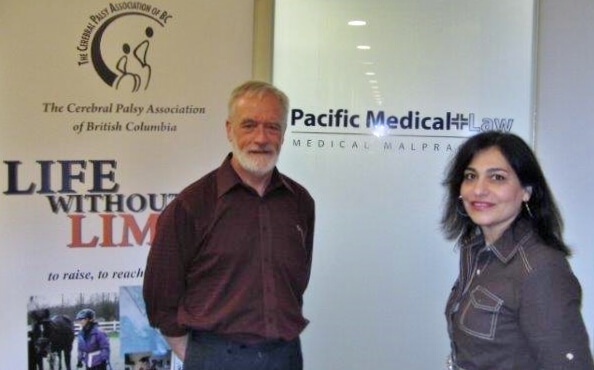 Pacific Medical Law donated $10,000 to support the Cerebral Palsy Association of British Columbia. These funds will go toward a variety of valuable services including providing bursaries for post-secondary school and summer camp, and supporting two new exciting programs being launched this year: dance and yoga for children with cerebral palsy. At Pacific Medical Law, we have worked with numerous children living with cerebral palsy and their families. We have seen first-hand the challenges these families face on a daily basis, and understand their needs. We have also witnessed the remarkable resilience and strength these families demonstrate in the face of their struggles. Families tell us about the tremendous benefit that legal settlements provide in terms of giving their child the best chance to achieve their full potential as well as easing the caregiving burden on the family as a whole. Unfortunately, many families will never receive a legal settlement. These families deserve our support. We are committed to helping these families by supporting the Cerebral Palsy Association of BC.